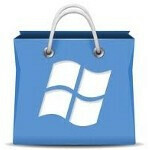 Are the apps in the Windows Phone Marketplace of a higher quality than the ones in Google Play Store? Microsoft made a presentation recently that showed that despite a much larger number of apps offered in the Google Play Store than in Windows Phone Marketplace, the average number of apps installed on a Windows Phone handset was basically equal to the number of apps the average Android user downloaded on his unit. The stats released by the Redmond based software giant shows that as of last March there were 50.9 apps loaded on the average Windows Phone model. While that figure matched the number of apps on the average Android phone as of November of last year, both trailed sharply the number of apps installed on the average Apple iPhone. 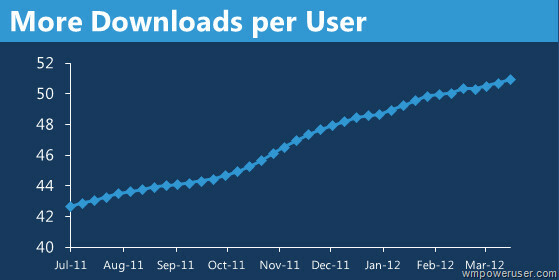 As of March 2012, the iPhone users had 88 apps installed on their device. Not only do these stats tend to lessen the importance of the number of apps available at a specific online applications store, it also reduces the importance of being able to add storage to your phone when needed. Both the Apple iPhone and Windows Phone models lack a microSD slot for expanding storage. Recent Android models usually have a 32GB capacity microSD slot and models running Android 2.2 or higher can store certain apps on their microSD card instead of using the phone's native memory. You would think that this would give Android users the incentive to have more apps on their phone than the average Windows Phone and Apple iPhone user. The bottom line could mean that there are higher quality apps found in the Windows Phone Marketplace than on Google Play Store as the average user on each platform has found the same number of apps to install despite the much larger selection for Android users. The numbers can't be extrapolated for Apple iPhone users so easily. The larger number of apps on the average iPhone can be partially related to the larger number of apps in the Apple Store than in Google Play Store and Windows Phone Marketplace. But still, i like how microsoft protects its marketplace. Unlike in android, WP users are safer from malwares that lurk in google play. I really love Google Play. There's so many freemium apps and gahd.. the live wallpapers.. *will this make them happy now? last sentence though is a fact, at least for me. yeah, that's something Google needs to learn from MS and Apple.. It needs a better filter for the apps.. I just hate how banners could just pop up from my notification bar.. Lucky for me, ad-free ROM almost 100% eliminates that..
COULD mean and DOES mean are two very different things to be honest, but then again this headline is just clickbait right? Not trying to deny the results of this study, just the assumptions made with the data seem speculative at best. i agree. there are so many variables that lead to users installing / uninstalling apps, and this data could just be the result of differences in character that typical iOS, Android and WP users portray. to me, more apps a person has DOES NOT EQUAL higher quality of apps in that market. for one example, if i started using a different mobile OS tomorrow, i wouldn't have more or less apps on my phone because i would install the apps that would help me do that similar things i used to do with my current phone. maybe because WP is not preinstalled with many apps in the first place? No, it's not an insult, but I'm just saying that many android comes with preinstalled apps like google apps (Gmail, youtube, search, maps, etc) and maybe a good percentage of the apps that is retained by the users are these apps that they need but didn't come preinstalled.. It's like this: I installed some games on my stock android which comes with many apps like youtube, Gmail, G+, Maps, etc.. So i added 7 games, whatsapp, instagram and facebook.. In total, I installed 10 apps.. And then I keep installing and uninstalling the games.. So i only retain 3 out of 10 apps.. this is a 30% retention.. Then I have a custom ROM with only Play store installed without other Google apps, So i installed Youtube, Maps, Navigation, Street View, G+, Search, Gmail, 7 games and the 3 apps.. In total i had 15 apps.. So i go through the same cycle with the games.. I retain 8 apps out of 15, hence the retention rate is now slightly more than 50%.. This might be the case with WP.. Many users can't find the usual apps they need.. But I don't know, we need more than just numbers to predict a trend.. If they do....they do. No big deal. Apple apps look like they are higher quality too. No big deal in that case also. That is why Nokia took Microsoft. Google Android is the most secure OS that meet US Government standards. maybe the fact that it is open source means that the govt can customise it the way they like and make it secure the way they require.. It's an open source project, you can take it for free and expand it the way you like it.. the only thing you need is the expertise to do so.. :) but yeah, for mainstream smartphones, Google needs to learn a thing or two from Apple and MS about security and app-filtering.. Too open can be bad as well..
Its a personal opinion of mine, but I install must-have or the hot apps straight away once I get a device. This doesn't mean that I will use all the apps that I install, but its good to see them there on my device. But with an android, any app you install starts working in the background by itself, and I haven't found a way out to stop them. This meant they were eating up the ram, so I had to delete a plethora of applications on my galaxy tab, thus bringing the number of apps down. This could be a role-player too. Strange title. This is more about proving that expandable memory is for other needs that "higher quality apps". No, I truly do not think apps are any more quality on WP than on Android. Obviously, with Android being open source, some malware makes it on the Google play store. And than Google is excellent at catching and removing it. How many Android users have you EVER known that have had infected phones? Not a one here. Sure the risk is there. But, it is small. I thought the mobile community had reached a point where fighting over app totals was long past. Bottom line is this, does your phone do everything you need it to? If so, the amount of apps in whatever market isn't important. Android needs to clean up there app store and protect users more and go for quality but the reason its like the way it is, is because they give you freedom but they can also sort garbage from qualit. Apps on Windows Phone not only look better, but seem to perform better as well. I know Google is all about "open policy" with Android and its apps, but there comes a time where you need to set some kind of guideline. Not to mention, in the Google Play Store, there are a lot of apps that are the same app but with a different name and icon. It's all a matter of personal preference, of course. I don't understand where the number of apps you install on your phone relates to the quality of apps. I only install what I need on my phone. If there are some super, high quality apps available that I don't need, I'm not going to install them. I disagree with this article. I have a Lumia 710, the apps on the marketplace isn't of better quality, its just that the number of apps are small in comparison, and isn't as appealing compared to app market in apple app store or google play. End users are limited to the numbers of quality apps in Windows Phone Marketplace, hence they only download / pay for quality apps. Once they there is no good apps left, well... phone is dead and waiting for new apps to appear. In contrast to apple app store, I find that there are more quality apps there, better looking in fact. Google comes at a near second, the apps feels a bit trashy at launch, but now looking a bit better now. I have 3 different devices with all 3 different OS's, and I have to say that Windows Phone Marketplace does not have better quality apps, I'm saying this even while using a Lumia 710, and using a Galaxy Tab for browsing and iPod at home for exercise.